One of the smallest medieval castles we have ever seen! Built in 1313 near Greystoke in Cumbria. 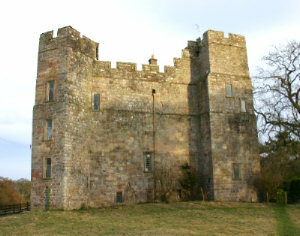 The Dacre family was one of the most powerful Norman families in Cumbria and built a number of castles including this one. Still intact and inhabitable - still lived in today in fact. This castle came up for rental during 2009. Only ruins left of this once magnificent medieval castle. Built on an ancient site, believed to have been occupied since prehistoric times! Construction took place in the early 1300's (around the time of Dacre Castle's construction). 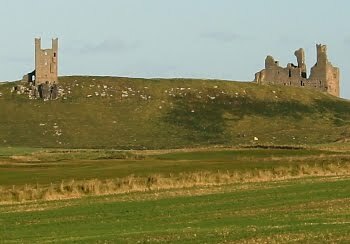 Located on the very top of a basalt crag on the Northumberland coast. The famous English painter W. M. Turner visited the castle and painted it on several occasions. Having been there and seen the breathtaking views, it's easy to imagine the impression this castle would make on a creative artist such as Turner. A Haunted Castle For TV's "Most Haunted"